France in London | Fancy a drink? Fancy a drink after work? Having a pint (or two) with colleagues is no doubt one of the most appreciated of British traditions. In France, generally, at the end of a working day, people wave their colleagues goodbye and rush back home, or they may go to a bar or a restaurant with their friends. Contrary to what British people might think, drinking in a professional context is not encouraged and even less of a habit. Most French people try to separate their personal life from their professional one. But in the UK, many young French people discover, with great pleasure, the charm of an after work drink…and what comes with it . 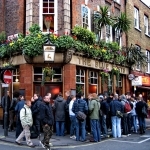 Being from a country where food is a subject of discussion in itself and where meals can last for more than three hours, the French are often surprised by the Brits’ drinking habits. 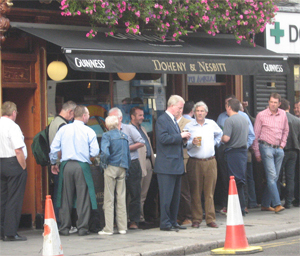 First, whether it is in a traditional pub or in a trendy bar in the City, people don’t always sit to drink. In France, homeland of cafés, finding a table, or at least a seat, is the number one priority upon entering a bar. In England, there’s no such problem, people simply stand with a pint in their hand. 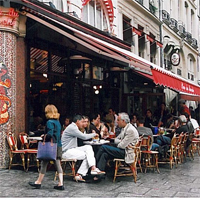 After 6pm on a sunny day, the sight of dozens of people just standing in front of a pub might surprise a lot of French people, more used to the lines of tiny rickety tables and basket chairs aligned on Parisian terraces. But the main difference between the French and the English post-work drink is, once again, food. In France, having a drink at the end of a long working day is called an “apéritif”, and this implies that it will be followed by a dinner. In English, a suitable translation for this word simply doesn’t exist! Most of the time, people just “go for drinks”. This is where young French coming to work in the UK lack training. For young adults, without any kids to go home to, after-work drinks sometimes last until late in the evening. But for French people, going from pint to pint until 11pm with only a bag of crisps as sustenance can be puzzling. According to the NHS figures, 40% of men and 33% of women in England and Wales drink more than the recommended number of units of alcohol every week. In France, contrary to popular belief, only 13% of men and 2% of women do so. That explains the lack of training of young French people arriving in the UK. But, according to some of my compatriots, who spent more than ten years in London, the habit comes very easily and post-work suddenly seems a lot less fun, once they go back to Paris.